With broad and long wings, golden eagles are one of North America's largest birds. Adults are dark brown with golden-brown on the back of their heads and necks. A worldwide species that both summers and lives year-round in parts of Canada, they favour mountainous regions, shrub lands and grasslands. The eagle flies high. I like its name and gold wings. I never saw one but hope to see it someday. First and foremost the golden eagle has been regarded as a symbol of courage and power because of its large size, great aerial skills and its hunting prowess. The early Romans associated the golden eagle with the god Jupiter and was used by some legions as their emblem. 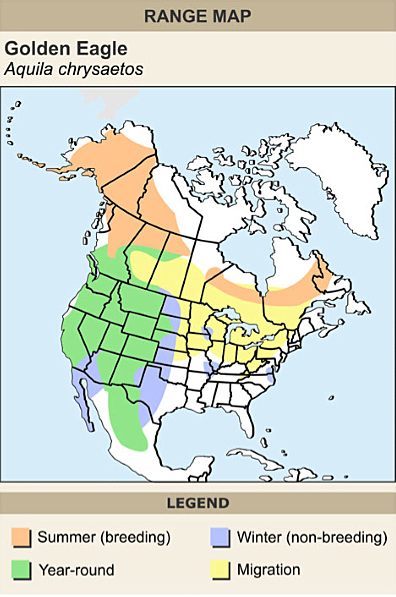 The golden eagle range is in the northern hemisphere and in North America its primary range is in the western mountainous regions although there have been sighting as far east as Ontario and Quebec. The golden eagle mate for life and produce two to four eggs of which only one and rarely two will survive to adulthood. The nest is large, crude structure made of sticks and twigs and is use from year to year. Their diet is chiefly mammals from mice to deer and will take birds while rearing the young. If food is in short supply, they will eat carrion. All this and the fact the golden eagle don't talk much makes it the perfect national bird for Canada. It is a magnificent bird! The Golden Eagle frequently nests in our area. It is larger than a Bald Eagle and is a respectable hunter as opposed to the Bald Eagle which is essentially a scavenger. The americans have the bald eagle. Lets make ours national bird a bigger and more golden version - the Golden Eagle! The majesty of this bird is equal to the title "Canada's National Bird. All things considered it should be right up there in the voting. I love all types of birds but the notion of having a Robin, or a Jay, or a Chickadee named as "My national bird" just doesn't cut it. The plaintive call of the Common Loon (there is nothing common about a loon) may tug at sentimental heartstrings evoking memories of summer lakes among voters here but the selection must go beyond such sentimentality. The Golden eagle is a AWESOME bird because is one the tallest and fastest raptor`s in North America !!! The Golden eagle length is 70- 84 cm, wingspan is 185-220 cm and he is as heavy 3000-6125 g. The bird eats mice , prairie dogs, ground squirrels and rabbits. Golden Eagles usually nest on cliffs. The nest is made from sticks, vegetation wires and antlers. Nestling Period is usually 45—81 days. The egg is quite big for an egg.The colour of the egg is white or pink. It takes 45-81 days to hatch . The baby is weak when it is born and it needs it's mothers help, but once they grow they are very strong . The Golden eagle fly very fast, they can be faster than cars reaching the speed of 200 miles per hour. He attacks his prey by diving and rising into the air with the prey in his mouth or claws. I think you should choose the Golden eagle because it`s really brave. When they think of USA they think of the bald eagle. The bald eagle is tough and strong so when they think of Canada they should think of the GOLDEN EAGLE. The golden eagle is big and strong, one of the fastest and largest birds in North America. If it becomes our national bird it won't die right away because its least concerned. The golden eagle is a sign of power and courage. That's why I think that the golden eagle should be Canada's national bird. I feel that the Golden Eagle has panache. Proud, bold, not afraid to take risks. I like the golden eagle because of the colours on it. I think that the Golden Eagle should be Canada's National bird because it's huge and Canada is the world's second biggest country. Second the Golden Eagle is strong and Canadians are strong. Third the Golden Eagle hunts in pairs and they have great teamwork. One Golden Eagle distracts the prey and the other Golden Eagle take the kill. Canadian work together pretty well. Finally the Golden Eagle migrates to Southern Ontario home to Ottawa and Toronto. These are my reasons why the Golden Eagle should be Canada's National Bird. This is a proud bird that portrays strength, power and sovereignty over which it glides. We need a strong national symbol and this avian certainly has it. The fears look in there eyes they put fear in to other animals. The biggest bird in North America (bigger than the bald eagle in the south). Strong predator. Majestic. Beautiful symbol of strength and courage. Let the U.S have the golden eagle and we should get the bigger, better…GOLDEN EAGLE! 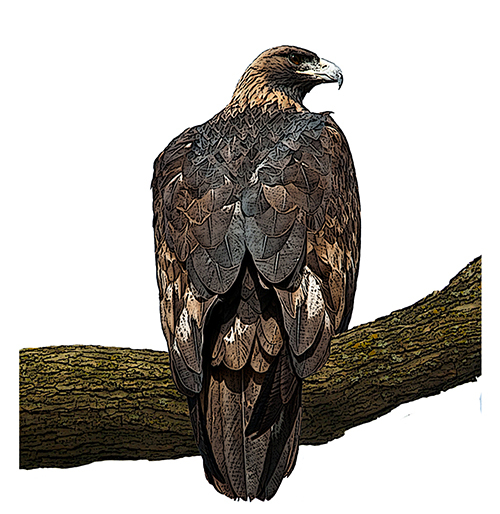 The golden eagle has golden and/or bark brown feathers, with a wing span of 2-21/2 meters and to top it off huge 9 inch talons. The golden eagle should be Canada’s national bird because it is referred to as the symbol of wisdom, courage, and strength by the natives. It should also be Canada’s national bird because it lives only in the Canadian side of the Rocky moutons. My first reason is that it is considered the symbol of strength by the Canadian 1st nation’s people and the Canadian veterans wear strong in all of our wars. My secant reason is that it is considered the symbol of wisdom by the Canadian 1st nation’s people and the Canadian veterans wear people of wisdom in all of our wars. My third reason is that it is considered the symbol of courage by the Canadian 1st nation’s people and the Canadian veterans wear cordages in all of our wars. My last reason is the golden eagle lives in the famous Canadian Rocky’s. And that is why the golden eagle should be Canada’s national bird. For my next reason this bird hunts our national animal the deer also this bird can hunt foxes, goat, bear and much more .Another thing is that this bird is known for its hunting so it is very well known. In the end I want the golden eagle to be the Canadian bird. Why you ask because of its habitat, representation and diet. L'aigle royal est le plus majestueux de tous et reste avec nous toute l'année même au nord du Québec. Très bien adapté à notre climat. Son caractère, sa détermination et sa prestance représente bien les Canadiens. Here on the ranch they live year round, amazing to see up close, "TRUE NORTH STRONG AND FREE"
Pour son image: Majestueux, fort, beau, qualité des rapaces en général (vision). Représentativité: presque partout au Canada (partout sauf à l'extrème est du Canada). Pour sensibiliser la population: le choix de cette espèce pourrait les sensibiliser à sa situation. I vote for the Golden Eagle as the National bird of Canada. The reason being is the Golden Eagle is strong and big like our country. It is also has its rare beauty, which is gold in color. We should select a bird that represents our country and also is currently not a provincial bird. Canada;Home of the Golden Eagle! Also, it's amazing and gorgeous too! And, if you look it up, it's actually kind of cute, depending how you see it! The Golden Eagle can kill a grey wolf, which might be dangerous to Canada's residents! They're possibly saving campers! I can't convince people well, I'm sorry! GOLDEN EAGLE FOR THE WIN!!!!!! Canada deserves a little dignity. Chances are the same people who think our national animal should be a beaver are voting to make the loon our national bird. The Golden Eagle is a dignified raptor that commands respect. If we choose the loon we should perhaps rename our country "Loonistan". The largest of the eagles, this bird is very methotical, if one ever gets the opportunity in seeing this bird in action. With it's gracefullness in flight, pin piont accuracy in hunting, and pure strenght with it's proven record of, "master of the air". This bird should be our choice for our national symbol, representing our land and people. Comparing our past and present challenges, overcoming many odds to end up where we are today, beautiful, strong, addaptive, admirered. All maybe words to describe a nation, and one of the greatest of birds to enhabit our world. D'un vol Majestueux, il plane au dessus des terres du Canada. Force tranquille et bienveillant, il est Protecteur de son environnement. L'Aigle est un oiseau sacré...Il est le messager des Dieux! biggest bird of prey you have on the list! i believe that we need a bird that represents strength and wisdom. second on my list is the snowy owl. Canada for far too long has had images of being passive and laid back. its now time in this age of terrorism and unsettled times, that we show a symbol of strength and wisdom.The Americans have the bald eagle as a symbol of strength as our neighbor we should pick the golden eagle as the brother bird. Canada... proud... strong... free!!!!! Being of native descent I have known this bird to be of great significance. The earliest native stories and legends speak of the Golden Eagle. These magnificent creatures inspire awe if we are so fortunate to see them in the wild. The Golden Eagle is already the proud and inspiring symbol of the Canadian Forces. A wonderful bird such as this should be the symbol of the country. Plus, you know it would look great as a heraldic symbol. Golden Eagles are cool! They are able to hunt small deer. Plus they hold all the symbolism of an eagle. Birds of prey have always been national symbols of strength, solidarity and dominance. The golden eagle is prime for the assumption of a symbol of Canada's just and desired domicile by the plenty that seek succor here from birth countries that have proved to be anything but a home for them. American eagles are scavengers. Golden eagles are true predators. More power, more dominance more symbolism. We are a small nation compared to other nations population wise but we ARE truly Big !!! My children received the Golden Eagle Awards from Eagle Ridge Public School in Ajax where we live. It was always exciting to see students were looking forward to the Assembly to celebrate and receive their hard earned character traits awards. That said, it seems like this Bird has its place in the Canadian wildness/nationality. It'd be interesting to see how the Golden Eagle fairs in this competition. The golden eagle is a beautiful bird of mythic proportions. Many believe it is the inspiration for the thunderbird of indigenous legends. Gorgeous, adaptable, and ranging all around the world. A great symbol for Canadians. comparing a Golden Eagle to a Bald Eagle is like comparing a Ferrari to a Cadillac. let the Americans have their Bald Eagle, we'll take the Golden..the true king of the skies! It's all bout dat golden eagle. Eagles are the most well evolved species on earth and are master predators. Because it's my favourite type of bird. Je suis descendante Montagnaise "Innu." L'Aigle Royal était considéré comme le messager des Dieux. La Sagesse, le Respect et l'Équilibre des éléments de la nature. ''L'Aigle Royal une force tranquille et protectrice qui plane sur le Canada." I saw one grab a bird out of mid-air from my condo building. Majestic as [email protected]%#.